The Dodge Challenger Hellcat lives up to its name. It’s devilishly fast, built for demolishing quarter miles but somehow allowed on streets—if their owners can stay alive. And then there’s the Demon. At least, that’s the case in a recent video of the two on the drag strip. The Demon and the Hellcat are basically all of the good things about America packed into relatively plastic-y vehicles with supercharged 6.2-liter Hemi V8s, only the Demon packs more power and drag-strip readiness from the factory. The Demon makes a baseline 808 horsepower and 840 HP on racing fuel, while the Hellcat tops out at 707 HP. The Demon also comes with a lot more toys. And a lot more waivers. Both are built for the drag strip, meaning they’re great at going in a straight line really fast. The good thing for the rest of us is that they probably couldn’t chase very well if we took a hard corner. But we haven’t seen much about how they stack up with each other, until this video popped up on YouTube channel Wheels the other day. The description says both cars were stock and on drag radials, and both got a good enough start to make the comparison feel legitimate. 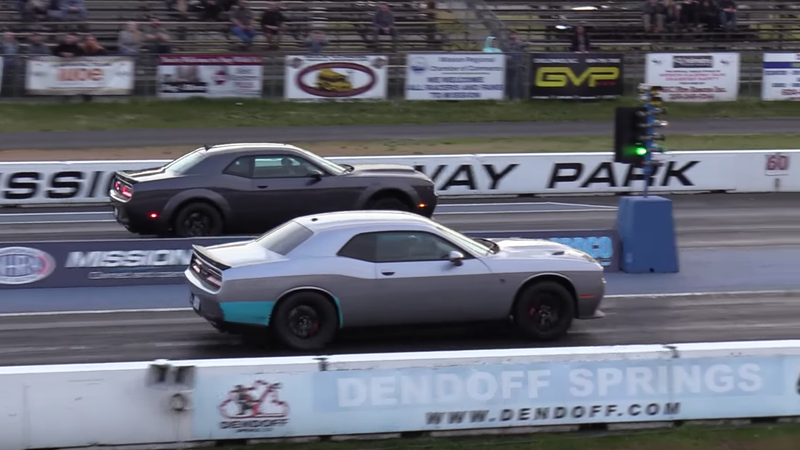 They were only a second apart at the end of it, with the Demon running a 10.07-second lap at 133 mph down the quarter mile and the Hellcat clocking in after 11.09 seconds at 124 mph. This Demon ran a little slower than its advertised quarter-mile time, which is 9.65 seconds at 140 mph. This is the part where most people would ask if the Demon’s $84,995 MSRP and dealer markups are worth it when the Hellcat starts at $65,495, but the truth is, they’re both still very, very expensive Dodges that can only show off their true muscle at the local drag strip. That’s a lot of money to be a hero for one or two nights a week—that is, so long as you don’t plant yourself into a wall. But God are these cars fun, when driven like responsible members of society.